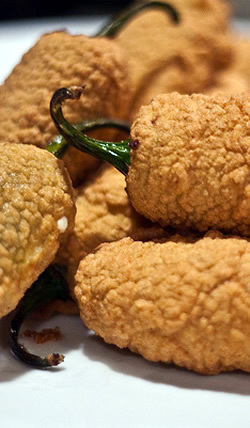 If you have a deep fryer, immerse the poppers about 5 minutes. Remove and drain, then allow to cool a bit. The pan frying process is slightly different because the oil can splatter. We know from personal experience. In a deep pan, add enough oil to cover about half of the peppers. You can use more, but oil can be pretty expensive this way, and you can't reuse it. Besides, it won't make much difference. Heat to medium so the oil is beginning to bubble. Add the poppers and cook on one side about 3-4 minutes, or until the breading is nice and brown. Then flip the poppers and get the other side. NOTE: Be sure to use a lid, as the oil can splatter and make quite a mess. Heated oil droplets can splatter pretty far and they burn the skin.